Baratza is a space for the investigation, training and showcasing of performing arts practice in the widest sense of the term. Our objective is to bring the community in contact with creation through a variety of activities and dialogues. Contemporary theatre and dance practice clearly stand out amongst our cultural offer, as well as a particular interest for emerging companies and artists, with whom we aim to share our resources as a measure of our our support. Baratza offers both regular and sporadic training opportunities, the latter include intensive sessions, masterclasses by visiting artists, “work-tables”, etc. It also offers creative residencies on a local level as well as nationally and internationally. It has a wide program of performances within the range of contemporary practice, reaching out to new audiences, families as well as a more “experienced” public. 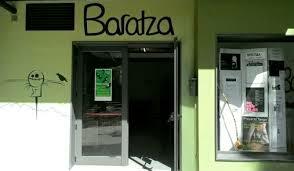 Baratza is a meeting space where cultural agents, artists and other collective can collaborate with Baratza so that their events and proposals may take place. Creation, investigation, training, showcasing, performing arts, meeting-place, dissemination.